The 101st Tour de France was, for the French, the most successful edition of their race in 17 years. Two French riders joined Vincenzo Nibali on the podium in Paris: Jean-Christophe Péraud and Thibaut Pinot in second and third place respectively. Before the race reached Paris though, the French riders had already given their country plenty of reasons to raise a glass. Lotto-Belisol’s Tony Gallopin was the only rider to take the yellow jersey off Nibali once the Italian had first slipped it on after stage two, but it wasn’t the last time in the Tour that Gallopin would be the pride of his nation and cause for celebration. As the world looked to Besançon, following the rest day (which conveniently came after Bastille Day) Gallopin headed to the start feeling fresh. Later that afternoon, in Oyonnax, 187.5km later, a combination of legs, head and heart, won him the stage. Gallopin attacked twice coming into the finish. A small group containing Peter Sagan chased down his first, but it was his second that took him clear to finish just in front of the galloping peloton. It was a stage win that will be remembered, possibly exaggerated, for years to come. Gallopin was riding his team-issue Ridley Helium SL with retro graphics, but for 2015 the Belgian bike company is putting this paintjob on bikes further down the podium. The Helium, which was the blueprint for the SL version, has the same frame geometry and colour scheme as the bike ridden in the Tour by Lotto-Belisol, but without the premium price. The pay-off, as you’d expect, is in the weight. The SL comes in at 780g for the medium frameset and 330g for the fork, whereas the standard measures in at just over 1.2kg for the frame and fork. The standard Helium frame is made from a blend of 24-ton and 30-ton High Modulus Carbon. 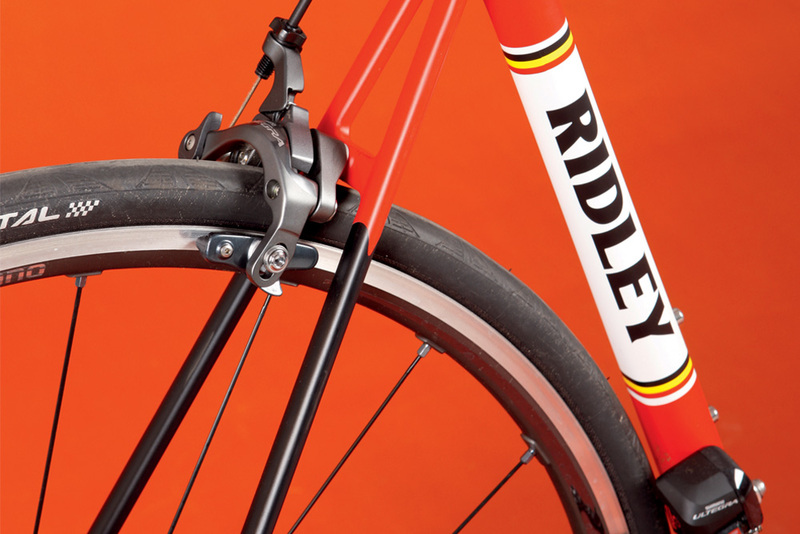 As with each frame Ridley produces, it adheres to the Form Follows Function philosophy. Shapes found in nature have inspired each tube. The strongest, and one which uses the least material, is of course the circle. The rounded tubes, not a million miles away from Cervélo’s original Squoval tubing, give the Helium more refined, classic lines, over its brutish brother the Noah. The aesthetic is further enhanced with this limited edition retro paintwork. A semi-oversized tapered barrel head tube provides a good trade-off between weight and stiffness up front. 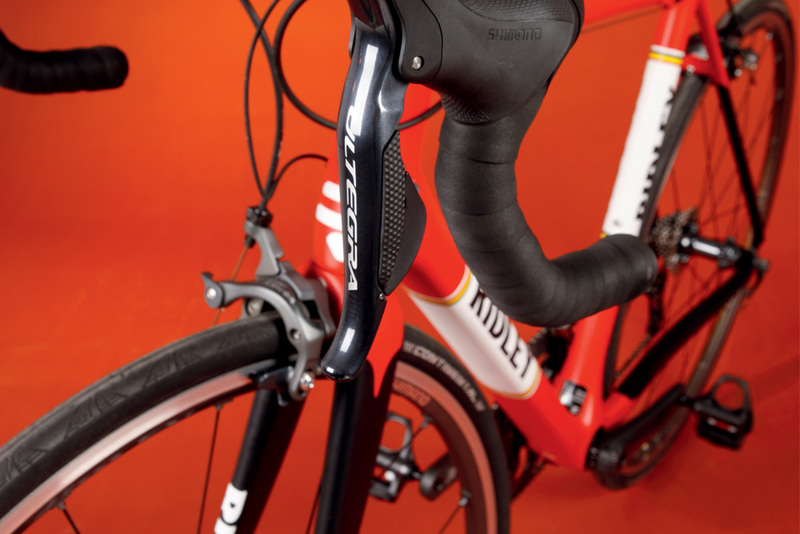 Paired with Ridley’s Helium specific high-modulus unidirectional carbon fork, the stability and stiffness, typical of all of Ridley’s bikes, is sustained. 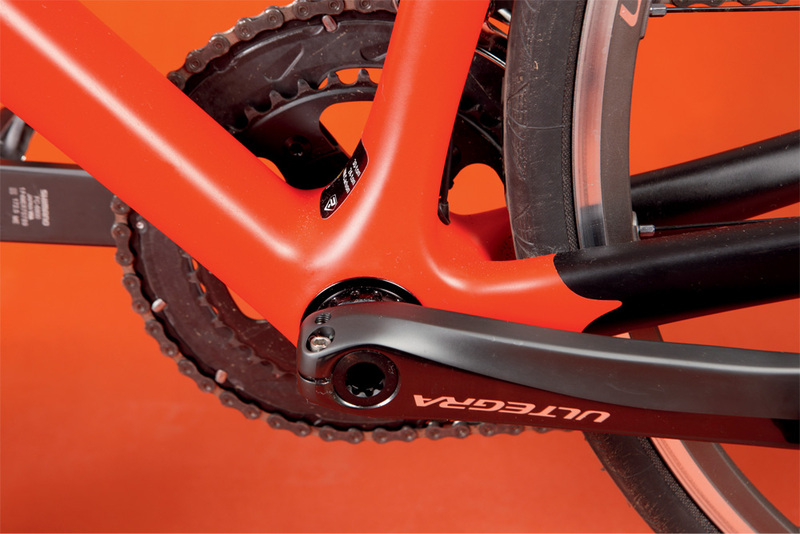 Underneath, Ridley has factored in a press-fit BB30 bottom bracket. It gives the frame greater stiffness for better power transfer. It’s also designed to work in cahoots with the Helium’s unyielding down tube, housing the dual-purpose internal cable routing for both mechanical and electronic groupsets. The Helium has a refined-looking frame and packs the punch of a bike designed to win races at WorldTour level. Super-thin seatstays are strong, but engineered to give a greater level of comfort to the rider — much needed in longer races. As ever, it’s said to promote vertical compliance and lateral stiffness. As bike sponsor, Ridley provides Lotto-Belisol with a frame for whatever a particular race dictates: the Fenix for the cobbled Classics, the Noah for the guys up at the sharp end of things, such as their sprinter, André Greipel, and for everything else in between, the Helium and Helium SL. It’s this that makes the Helium so popular with riders like Tony Gallopin, and also everyday cyclists who want a bike that will handle anything. The popularity of the stylish red and black colourway, as ridden by Lotto-Belisol, has prompted Ridley to offer it on the Noah, Helium SL and for the first time the standard Helium. If you want one, get your order in as they’re a limited edition.